Leticia "Letty" Castro worked at UTSA for 10 years. 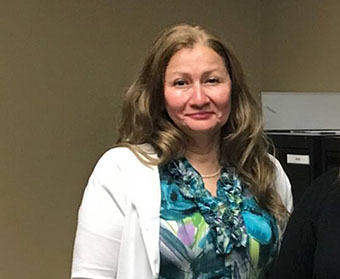 (May 25, 2018) – The UTSA community is mourning the tragic death of Leticia “Letty” Castro, administrative associate in the Department of Interdisciplinary Learning and Teaching (ILT). With more than a decade of experience at UTSA, Castro was a familiar face on campus to many Roadrunners. Castro will be among those honored at the annual Roadrunner Remembrance Ceremony in April 2019, which features readings and music to recognize the contributions of Roadrunners who have passed. During the ceremony, feathers will be placed in a nest to honor Castro and other Roadrunners who have passed. Faculty and staff who need assistance following Castro’s passing should contact Deer Oaks EAP Services at 1-866-327-2400 to schedule an appointment and ask for the on-campus counselor. Counselors are also available throughout the nation to assist UTSA faculty and staff located off campus.